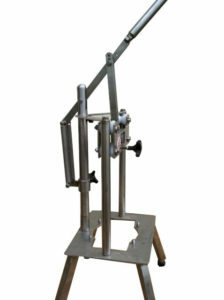 The F1000 is a manual cutting system perfect for slicing, wedging, wedge/core, petal cuts and more in a small space. With the ability to process up to 24 pieces per minute, the F1000 can be the perfect system for a fast, convenient, easily storable work station set up. This manual system accommodates a multitude of slice, wedge, sticks and coring blades - which are all easily changed in a matter of minutes. 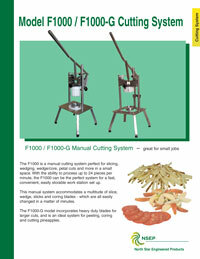 The F1000-G model incorporates heavy duty blades for larger cuts, and is an ideal system for peeling, coring and cutting pineapples.